Heckler! 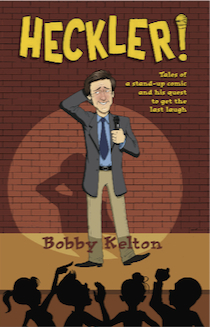 chronicles the odyssey of comedian Bobby Kelton, who morphed from a shy kid growing up on Long Island, New York, to a comedy star on “The Tonight Show ” and at Caesars Palace. Heckler! is a funny and poignant look at a comedian’s journey and the ups and downs of making people laugh for a living. When I started in comedy, I had an idealistic view of what it meant to try to be funny for a living. I had watched many comedians as I was growing up, and I was drawn to their cleverness, their ability to command and move an audience to laughter, and to the synergy of love that ebbed and flowed between the comic and the audience. But like just about any profession or career, I could not have foreseen the pitfalls that awaited me. I was about to learn that the business of comedy is indeed a business. That there were incidents to come that would test my mettle and my character, not to mention my sense of humor. Perhaps the biggest challenge that I did not see coming was that there are those who come to see your show who derive great pleasure from interrupting it. These people, known as hecklers, can lurk in any corner of every show room. Sometimes they’re drunk, sometimes just smart asses, but they always have one goal: to try to be the center of attention. Perhaps my greatest accomplishment as a comedian is that I’ve never let a heckler get the better of me, or damage my performance. Fortunately I’ve always been able to rely on my experience and intellect to prevail and silence these miscreants. I found out, however, that the perils of comedy extend far beyond those in the audience who can make your performance a challenge. There have been situations I’ve faced in my career that have been surreal, unpredictable, scary or embarrassing. What you are about to read encompasses many of these stories. For those who think it’s easy to tell jokes, this book will show why comedy is an endeavor for only the strong and the brave. Please Don’t Let This Be Her! is the hilarious chronicle of comedian Bobby Kelton’s venture into cyberspace to find his true love. It’s a collection of his humorous and yet painful real life internet dating horror stories. The account of his hapless but hopeful search for love is insightful, relatable, poignant and most of all, just plain funny. Please Don’t Let This Be Her! combines tales of the author’s dating adventures with prescriptive suggestions about online dating, along with musings on the search for the right partner and the truths he discovered during the journey. “Let’s have a warm welcome for Bobby Kelton.” Oh, by the way, that’s me. And that’s what Johnny Carson used to say, introducing me more than 20 times on “The Tonight Show.” To have appeared often on that incredibly successful late-night series was both an honor and a launch pad, from which I’ve built a 30-year career as a stand-up comic. I’ve been able to travel the world, making people laugh from London to Las Vegas. It’s all been good, except my parents want back the money they spent sending me to college. One of the perks that I’ve enjoyed, by being on stage and in the public eye, has been the ability to date many wonderful women. I discovered that not only did I have an easy, sure-fire opening line, by inviting them to my show, but it also gave me an aura that had many girls approaching and flirting with me. But with time, age, changing dynamics and perceptions, I found that it has become much harder to meet women, and especially ones that might be of relationship quality. Just like a struggling baseball pitcher, I had been relegated to the dating bullpen. So like millions of others who have a computer and some free time, I decided to try online dating. Though skeptical at first, I began to see that it is just an alternative way to meet people. Millions are doing it and many find partners, or at least that’s what the ads say. But what started out as an eager and anticipatory venture to find true love evolved into a series of ill-conceived dates, disappointing meetings, and communications screw-ups, topped by a plethora of strange behaviors. The most rewarding result of all this was my new-found ability to order any Starbucks drink available without even looking at the menu. When I told friends some of my bizarre dating episodes, I realized that they were actually very funny, and that my experiences could be informative and amusing to others on Internet dating, or indeed, any dating at all. Thus, I began to write about my thoughts, fears, insights, and discoveries that led me to personal truths regarding not only dating on the Internet, but the larger picture of the journey to find true love. With each new experience, I could see that the search for love is, just like life itself, something to be able to laugh at and play with, knowing that “fate” is really the ultimate Cupid. Thus, the mantra, “Please don’t let this be her” – which evolved from waiting for online dates at Starbucks – really was a harbinger of hope: the hope that someday, when perhaps I least expect it, I’ll say “Please let this be her.” And it will be. I can’t wait to read this! Bobby is soooo funny! Would love to see him perform again!